Since 2006, the French "Grand Prix de l'Ingénierie" has recognized engineering projects and/or teams that are remarkable in terms of scope, innovation, complexity, and in their susceptibility to redesign the future. 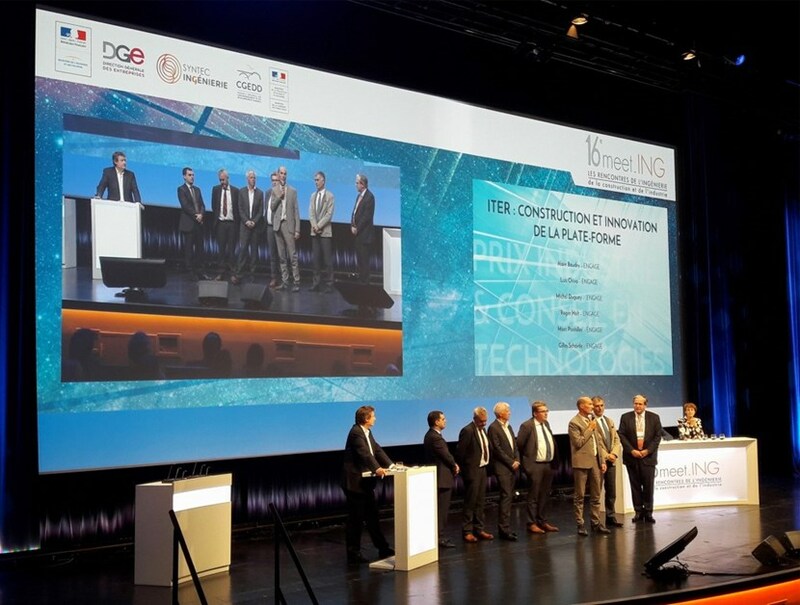 The 11th edition on 19 October singled out the consortium ENGAGE, the architect/engineer for ITER construction, for its Industry and Technology Consulting Prize (Prix Industrie & Conseil en Technologies 2017). ENGAGE—composed of the French firms Egis and Assystem, Atkins (Great Britain), and Empresarios Agrupados (Spain)—was selected in 2010 by the European Domestic Agency as Architect/Engineer for the elaboration and design of the ITER scientific facility (buildings and infrastructure). The ENGAGE team of 230 on site has surmounted a number of technical challenges: developing a numerical 3D model of the buildings with all interfaces identified; designing a one-of-a-kind anti-seismic system for the Tokamak Complex; positioning thousands of embedded plates; and creating concrete formulations for specific zones. ENGAGE has also built a database in order to trace the progress of the project, generate indicators and download detailed documentation. Every month more than 70,000 connections to the database are recorded and more than 10,000 documents published. The "Grand Prix de l'Ingénierie" was designed and created by the French Federation of Engineering Firms (Syntec-Engineering) and is awarded annually in partnership with France's Ministry of Ecology (Ministère de la Transition écologique et solidaire), the Directorate General for Enterprise (Direction Générale des Entreprises, Ministère de l'Économie et des Finances), and Groupe Moniteur. For further information see the article on the European Domestic Agency website and the Syntec-Engineering video on the work of the ENGAGE consortium for ITER.